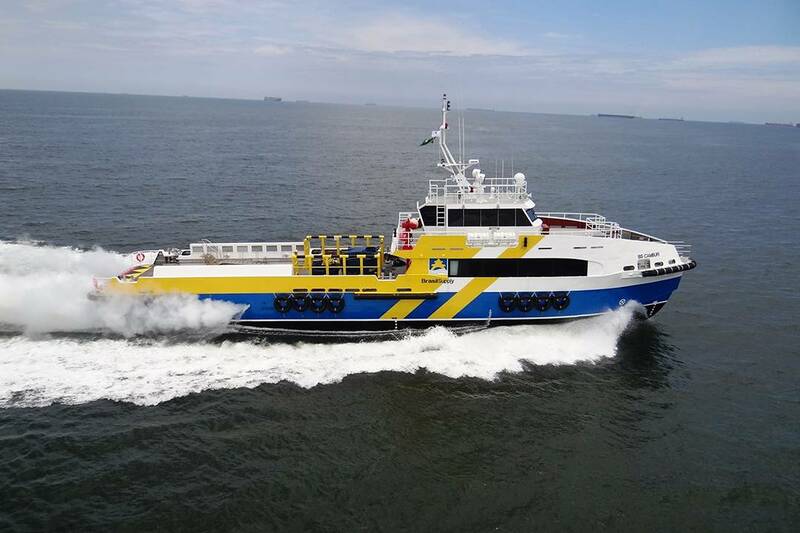 Fast, capable crewboat design and construction continues to be a leading edge niche in the global marine market, the latest manifestation being the BS Camburi, a 36-meter monohull crewboat built in Brazil by Arpoador Engenharia to the Petrobras type P2 specification, for Brazil Supply. Incat Crowther designed the boat. The vessel’s aft main deck features a large open deck, separated for two main purposes. The aft portion, measuring 60.5m2, is dedicated to a man-riding basket. The forward portion, measuring 28 sq. m., is dedicated to cargo, with large cargo rails offering heavy duty protection. The main deck passenger cabin houses 60 seats in a mixture of forward-facing and booth styles. Ample luggage storage is also provided, along with a pair of heads and a beverage counter. A sturdy and safe bow loading platform is integrated into the design to facilitate passenger embarking and disembarking from offshore facilities. This is served directly from a large, sheltered door and companionway at the forward end of the passenger cabin. Served by a stair tower aft with direct access to all decks, BS Camburi’s wheelhouse features forward and aft control stations. The hull accommodates 10 crew in 5 cabins, alongside a galley, crew mess and bathrooms. 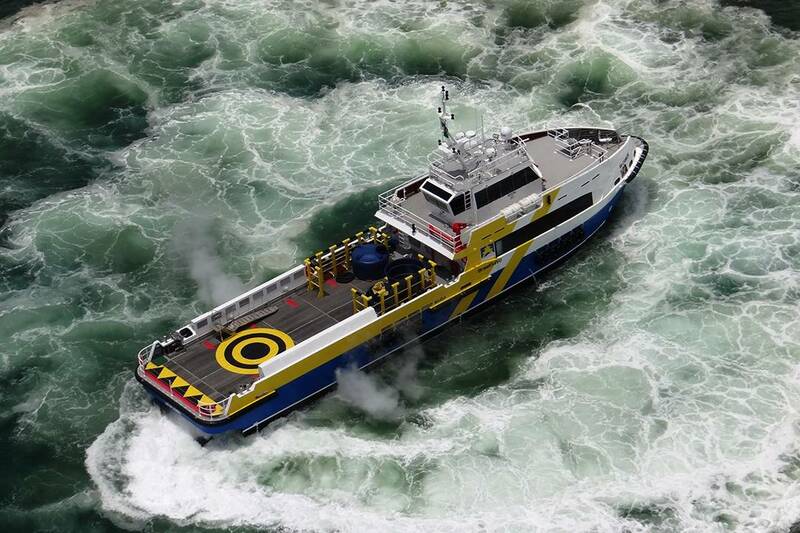 BS Camburi is fitted with a trio of Caterpillar C32 main engines, coupled to Doen DJ290 waterjets. The center engine drives a 600 cu. m./hour fire pump. 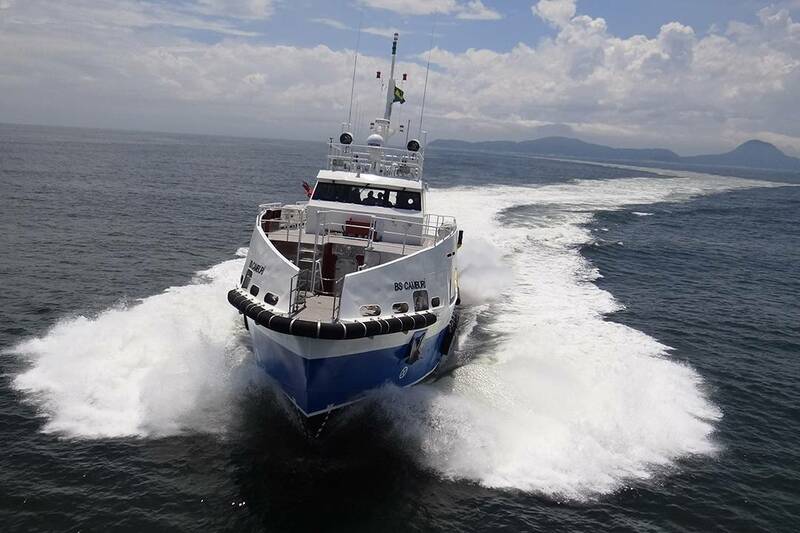 On sea trials, BS Camburi achieved a top speed of 25 knots. She has a fully loaded service speed of 17 knots.